UMass Lowell fans cheered heavily as the clock counted down to zero as the No. 14 ranked UMass Lowell River Hawks (17-8-2, 11-4-2 HEA) blanked the No. 2 ranked UMass Minutemen (21-5-0, 13-4 HEA) 2-0 behind a stellar performance by goaltender Christoffer Hernberg and two first period goals. The shutout, which was Hernberg’s third of the season and eighth of his career, extended the River Hawks unbeaten streak to 10 games. The first goal came less than three minutes after the puck was dropped, as River Hawks winger Chris Schutz sniped a beautiful one-timer over the glove side of Minutemen goaltender Matt Murray. The River Hawks extended their lead later in the first period after the Minutemen blew a power play opportunity by committing a holding penalty seconds after the River Hawks’ Reid Stefanson was sent to the box for tripping. With the 4-on-4, the River Hawks swarmed the Minutemen’s zone and squeaked out a goal from defenseman Anthony Baxter, a goal that Murray would have wanted back. “I thought our first period was very opportunistic, and I thought out second period was even better,” said River Hawks coach Norm Bazin. The River Hawks kept up their stellar play in the second period as they pelted Murray with 15 shots, and Hernberg turned away seven. 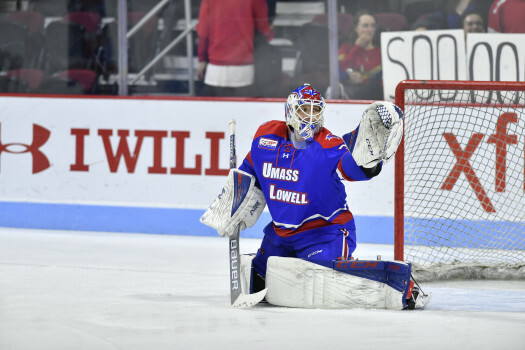 The River Hawks dominated possession of the puck in the second period, constantly forcing Murray to make crucial saves, and did not allow the Minutemen to cycle the puck in the River Hawks zone. The Tsongas Center has been a house of horrors for the Minutemen, as they have not won a game in the River Hawks building since 2011. The Minutemen fell flat on offense and defense throughout the game, either constantly turning the puck over in the River Hawks zone or not getting back on defense which led to a handful of odd-man rushes for the River Hawks. The third period was much of the same. The Minutemen had a fair share of scoring chances, but could not get great looks from the slot, an area that the River Hawks had locked down. The River Hawks penalty kill unit played immaculate, as the Minutemen only registered four shots on goal during their three power play opportunities. The Minutemen pulled Murray from net with over three minutes left in the game, but the defense of the River Hawks was too much, forcing the Minutemen to take bad shots from areas they were not comfortable. The River Hawks return to action Friday against Providence from the Tsongas Center. Puck drops at 7:15 p.m.